- Dual chip voltage regulation and overcurrent protection. - Multiple voltage regulation components (voltage regulating diode and linear regulator). - 6-pin PCI-E power to 15-pin SATA power cable is more powerful and reduces the burden of the motherboard. - Gold plated contacts make a better connectivity and long lifespan. - Supports 1x,4x,8x,16x PCI-E slot of the motherboard. 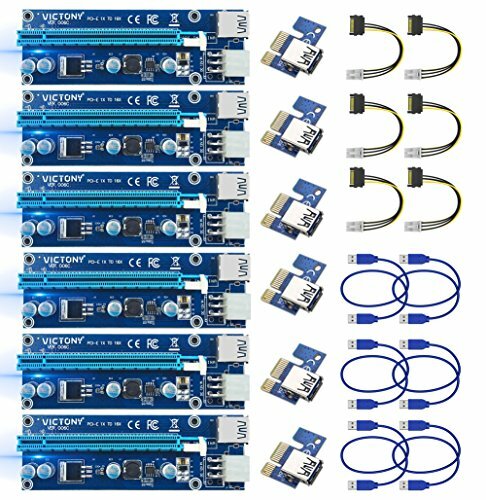 HIGH RELIABILITY VICTONY 6pin PCI-E Riser, dual chip riser kits are the perfect solution for setting up Ethereum mining rigs (or any other GPU-mined altcoin), whether small open air rigs or large rack based miners.Provides Fine-Tuned Reliability Perfect For 24/7 Mining Operations! 4 High Quality Solid Capacitors,LED power indicator. Voltage Regulation, and Overcurrent Protection, deliver power to Graphics stably and safely. Gold plated contacts for flawless connectivity and a long lifespan. Includes 6-pin PCI-E power to 15-pin SATA power cable for more flexibility connecting to your power supply, reducing the power burden on your motherboard and ensuring maximum compatibility. BUY FROM VICTONY ONLY. ANY OTHER OFFERS ON THIS LISTING ARE UNAUTHORIZED SELLERS AND NOT SELLING THE PRODUCT ADVERTISED. The product is backed by a 6-months limited warranty and emergency replacement assistance. Any problem met on you pls contact us at anytime and our service always be there.